Merry Christmas & Happy New Year 2011! Here's wishing all of you a very merry Christmas & a great year 2011 ahead! I'll be away for camp during this last week of the year, so I won't have the internet connection. The Ruthless Eater will be back next year with more food places to share! I just realized that I haven't posted this post on my blog. 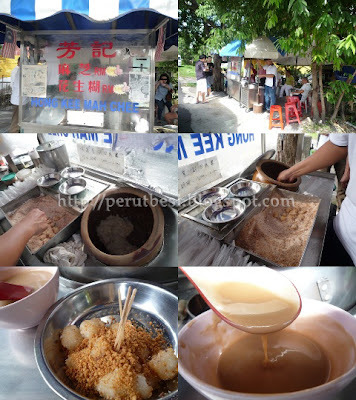 It's one of the best char kuey teow in Kuantan! I MUST introduce this stall to you! It's just at the market area in town...excellent taste, SO fragrant, & for my Malay friends, it's halal! Oh, I just fell in love with this fried kuey teow....really! For just RM3.00/plate, you'll get an excellent plate of fried kuey teow! Prawns, eggs, tauge, cockles, & smooth, delectable kuey teow, fried in the uncle's special dark sauce. PERFECT! *delighted! * I was very glad when Esther informed me that my article has been published in BFJ.com's eMag! It's an article that I've written previously on this blog & I've rearranged it for the purpose of publishing in BFJ.com eMag. Ah...bliss! I'm very glad to know that business has picked up tremendously & that the quality of food has been very consistent as well :) Kudos to Nihon Kai! Christmas is just a week away! Malls are packed with people purchasing gifts for their loved ones, while hotels are just as busy offering delightful ranges of food & entertainment. The Christmas Light-Up began with carols filling the air, sung by a group of young carollers, followed by the lighting-up of Christmas trees in the hotel. It was indeed a beautiful occasion! Santa Claus was also around to give out candy canes, while Santarinas were moving around with baskets of teddy bears to be sold for a charity fund-raising event. After all the hustle & bustle at the lobby, all guests were invited to a Christmas buffet spread, specially prepared by Impiana’s team of chefs. You’ll find the much awaited Christmas turkey, roast lamb, & a good array of other meat (the chefs at Impiana are somewhat meat-lovers, hence the abundance of meat dishes! ), alongside the all-time favourite salad bar. There were also more than 7 types of cakes & cookies, much to my delight! Ah, I'm so thankful for the invite from Sharifah :) Good food, good fellowship! Coming to think of it, the true meaning of Christmas has somewhat dwindled to commercialism. Amidst the lovely food, joyous laughter, & love-filled gift exchange, Christ-followers around the world will be remembering the greatest gift to all mankind, Jesus Christ, who came into the world more than 2000 years ago, in the form of a human, yet fully God, to save us sinful mankind from eternal death; all for His glory. God’s love through His Son, Jesus Christ, is the greatest gift given, & the greatest gift to be received. Have you opened that gift that has been given to you... a long time ago...even before you were born? Have a blessed Christmas & a great year ahead! Almost everyone loves something sweet & icy-cold every now & then. Who wouldn’t – especially on a hot day (all year round in Malaysia!)? With the Malaysian government going full-on with advertisements & campaigns for all citizens to lower their sugar intake (thanks to the spiking-high rate of diabetic patients), I’m sure many Malaysians are caught in a dilemma on whether to satisfy their sweet tooth, or to abide with the “angelic advices” given by the government. Hear ye, hear ye! Especially girls & ladies, & of course the gentlemen as well! 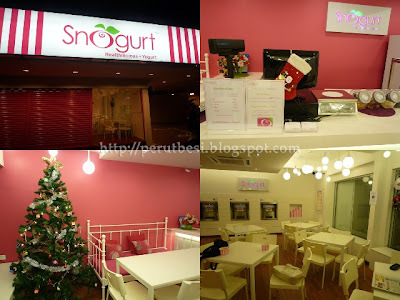 Snogurt started its first outlet at SS15, Subang on the 10th of October 2010. Kicking off its business at 3pm on the day of launch, Snogurt has had a steady flow of customers, mainly students from neighbouring colleges & of course residents from Subang Jaya itself. This brand is the brain-child of 2 business partners, Mr Lau & Mr Yap. As frozen yogurt is very popular in Indonesia, Mr Lau decided to bring the revolutionary dessert to whet the appetite of Malaysians (who just enjoy eating)! Snogurt is a self-owned outlet & both gentlemen will consider licensing their brand name in the near future. This 1st outlet could accommodate an approximate of 30 customers at one go, but most of their customers are take-aways customers. If you prefer to sit in & enjoy your cup of Snogurt, go ahead & sink your teeth into cold yogurt, while surfing on their free Wifi service! 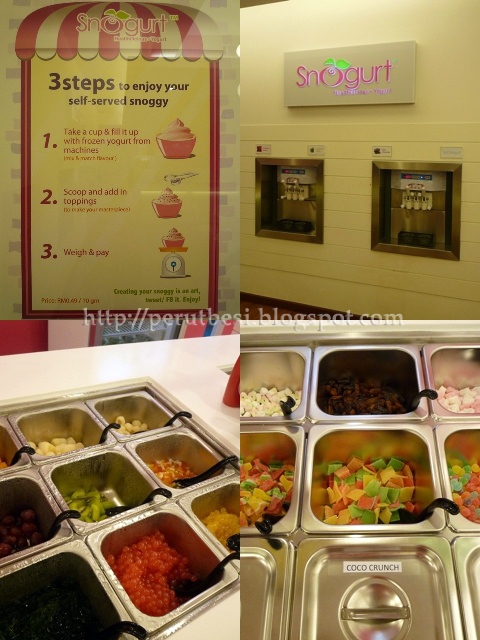 Snogurt boasts of its 3 simple DIY (Do-It-Yourself) steps/concept for your cup of frozen yogurt. Firstly, grab your cup, and then pick your choice of Snogurt. After that, select your preferred topping(s) & finally, weigh your cup of Snogurt (RM4.90/100g) & pay at the counter! Snogurt’s alike a smooth ice-cream, but with yogurt as its base. So, anticipate the slightly sourish wake-up call in your humble cup of Snogurt! 1. The yogurt powder mix is imported from Italy. 3. Currently, there are 6 flavours at Snogurt i.e. Just Snogurt (Plain), Shy Lychee, Chich Chocolate, Screaming Apple, Strawberry Smooth, & Mango Tango; the 1st three in the list being the most popular flavours. 4. The Snogurt mix can only be kept for a maximum of 3 days, after which the frozen yogurt will be discarded. You can expect fresh Snogurt everyday ‘cos they have been making new batches of Snogurt everyday! 5. The Snogurt dispensing machine is also imported from Italy where the parts are manufactured, but the parts are assembled in China. What’s important is that the engine & compressor of the machine are from good-ole-reliable manufacturers! Just Snogurt – Plain & simple sourish yogurt, for those who prefer something with no-frills. Strawberry Smooth – If you’re a strawberry fan, this is for you. I find this quite sour compared to the Chic Chocolate. It also tastes more “milky” than the Chic Chocolate & the Just Snogurt. Shy Lychee – This certainly isn’t a shy flavour! In fact, it’s no doubt one of the most desirable flavours of the 6 flavours available! I enjoyed the pleasant sweetness in the slightly sourish & milkfish frozen yogurts...it kinda reminded me of some melon taste! Snogurt is opening its 2nd outlet at the end of the month at Taylor’s Lakeside College. Students, lecturers, & administrative staff – look forward to the revolutionary Snogurt stepping into your campus soon! Try not to miss out sinking your teeth into the famous peanut mah chee at Pasir Pinji while you're at Ipoh. The "mah chee" is chewy, not too soft 'til it sticks onto your teeth, & not too chewy 'til you find it tough to swallow. It's my 1st time having such lovely mah chee (unlike the ones I get from pasar malams/night markets). The grounded peanut + sugar that goes with the mah chee is also fine & not over-powering with sugar, which was excellent! The peanut gruel/"fa sang wu" is also smooth, slightly salty, & pleasantly sweet! Oh, so delicious...I could have bowls of it!! Not too far from Hong Kee Mah Chee's stall stand the crispy "siew yoke"/roast pork stall & the deep-fried cempedak+sweet potatoes+"nin kou" stall. You can get pretty delicious tea break goodies here! Address: 798-799, Jalan Sekolah, 31650 Ipoh, Perak. Business hour: 6:00p.m. - about 2:00-3:00a.m. 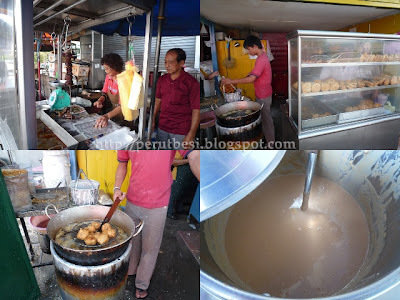 Note: It's located directly opposite the Pasir Pinji police station & isn't too far from the wet market. Fluffy & fragrant "oily" rice served with roast/steamed chicken...it's so good, you'll have to line up for your dose of Ipoh's famous chicken rice! You'll also find some of the most famous food items around the area e.g. Funny Mountain's Tau Fu Fah, Aun Kheng Lim's Salt-Baked Chicken, & Sin Eng Heong's Kaya Puff...just to name a few. 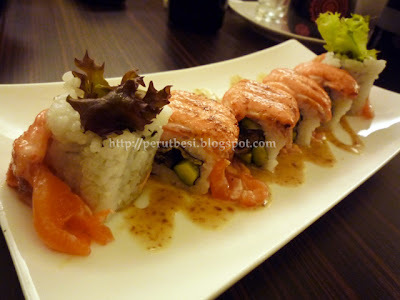 Address: 34, Jalan Raja Ekram (Cowan Street), 30450 Ipoh. Business hour: 5:30a.m. - 3:00 p.m. In my personal opinion, the dim sum here is much better than Foh San's. The last time I had my breakfast at Foh San, I was quite disappointed. Not only do I have to wait for a long time for a place to sit, I also need to wait for the food to come by *sigh* The only down-side at Chang Keong is the lacking of air-conditioner. Apart from that, the dim sum here is good! 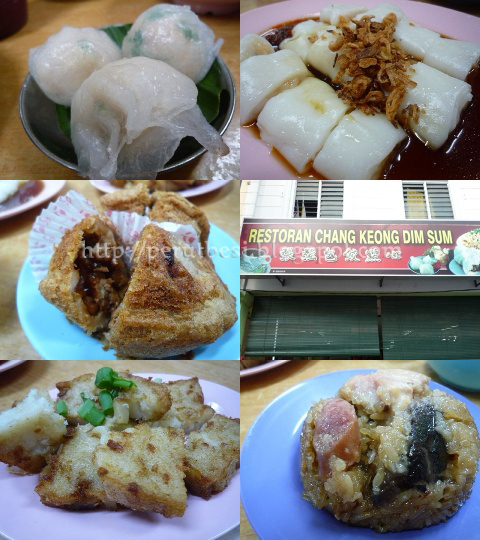 The fish ball/paste is recommended, plus their variety of dim sum is also quite commendable :) It doesn't have as many "fancy dim sum" like Foh San, but it's good enough for a satisfying meal of Chinese dim sum for the PerutBesi! I hope this post will help you when you're food hunting around Ipoh ;) Stay tuned with PerutBesi for I've more food post to come! Restoran Luen Fong was our chosen one! The prawns were really fresh...they were still swimming before their life ended...hahaha. The flesh is sweet, "crunchy", & the whole dish's taste just felt very naturally pleasant :) I will recommend the prawns to be served steamed than fried. You'll get to taste the "originality" of the prawns! Just check out the ooze! In total, we spent RM45.00 for the whole meal, inclusive of tea (we didn't have rice as we were quite full from a late lunch). I thought it was quite a worth-paying meal - simple, delicious, & considerably cheap. But oh, I still miss the seafood in Sabah (CHEAP & FRESH)!! 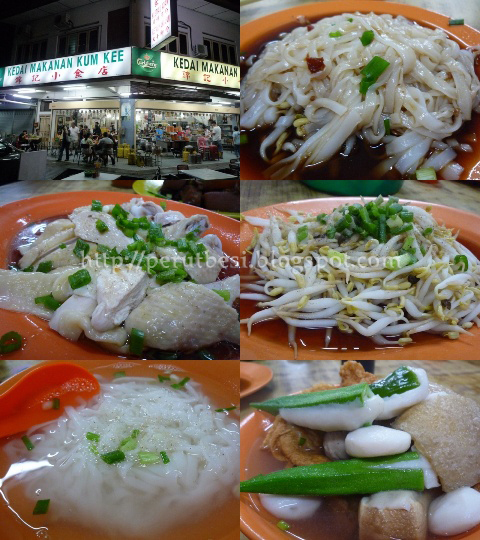 If you're around Kampar/Ipoh area, you might want to try out some seafood at Tanjung Tualang ;) It's relatively easy to find...if you've the GPS, just check out on Market Street, Tg Tualang & you'll get there without much hassle! Pusing is a very small town around 40 minutes from Kampar. The drive from Kampar to Pusing town was truly enjoyable as the weather that day was really lovely. Notice something unique among the crowd? ;) I zoomed my camera in to capture this! 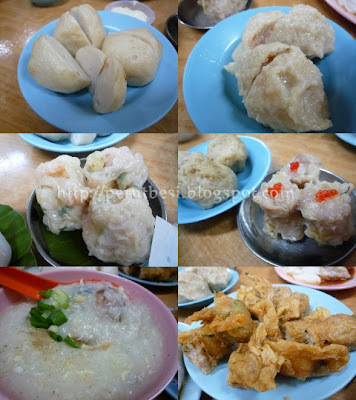 Apart from the famous fresh prawn noodles ("sang har mee") at Pusing town, this town is also well known for its variety of dumplings/"kuih". Right across Restoran Ming Feong, where you'll find the delectable fresh prawn noodles are dumpling stalls with a colourful variety of dumplings! Their "dark green dumpling" (I've no idea what it's called, but the dumpling is made from some leaves + flour) is not too sweet, nicely chewy, & not too oily as well :D Lip-smacking! Even after 2pm on a weekday, this restaurant still has a good crowd! This is the much-loved noodles here...hmm...I felt that it didn't have enough wine! In my opinion, the soup/broth was a little bland, although I admit that ginger was aplenty. The only thing that I have no complaints for are the noodles, which were smooth & not too soft...RM8.00 for a bowl of fresh prawn noodles that isn't up to PerutBesi's standard? Hmm...I may not bother going back there for another bowl. Heh. Back in Kampar, claypot chicken rice is a must try for dinner ;) The stall here opens from 5pm onwards. 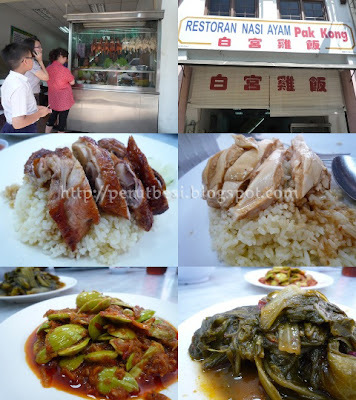 This is the best claypot chicken rice stall in Kampar! Business Hour: 5:00 p.m. - 12:00 a.m.